It's back to the Catskills again as the Jewish Television Network has nominated a video clip of Freddie Roman doing his stand-up shtick as the best and most viewed of their videos for 2010. We were surprised to realize that we hadn't seen it and suspect that many of you also haven't seen it. 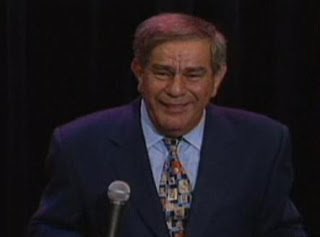 Born Fred Kirschenbaum in Queens in 1937, Roman has delivered his humor in stand-up routines in most Borscht Belt hotels and has been a headliner in Las Vegas and Atlantic City. He is still actively performing today. As the year 2010 draws to a close, we think it's fitting to spend a few minutes with a master of Jewish comedy and raise our laugh total for the year. Enjoy!